Miss Mercy is an amazing Pin Up. Fierce, captivating, firey. "I love this quote from Marilyn. It speaks for hundreds of thousands of women all over the world... i think, as women, we all want a man who not only appreciates a strong, beautiful woman but someone who will put up with our sometime irrational behavior and that fact that it takes us a little time to get our hair & make-up right!" How Did Your Pin Up Life Start Miss Mercy? "I’d always looked-up to pin-up models and wished that was me, but i didn’t think i could possibly do what they do! 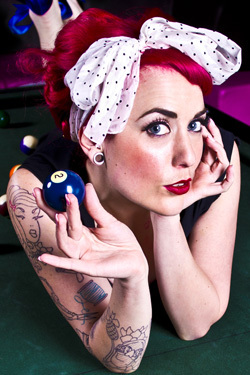 Around 18 months ago, my sister and I organised a girls day out to do a pin-up shoot with Helen McLean. I had the most amazing time and i felt so comfortable in front of the camera (much to my surprise). When i saw the final photos i thought for the first time EVER that i looked like one of those pin-up girls! After i got the photos, i took a chance and uploaded my set to Model Mayhem and in a week i had people asking me to do shoots.....everything just grew from there! Modeling is actually a lot of work, long days and can be a lot of traveling as well as networking.... i’ve worked really hard over the past 18 months, been purely lucky in some instances and met some of the most amazing & talented people in the industry which has ment i’ve been a cover girl, had interviews, modelled for amazing fashion designers and have now also made the state finals for Miss Pin Up Australia 2012"
"I refused to have my photo taken up until i was 19 & was a tom boy growing up." How many tattoos do you have and what meaning do they have? "I love tattoos and expression through body art in all its forms. But i’m also one of those people who needs to have depth in everything i do.... especially if it’s going to be with me for ever, like my tattoos! My first tattoo was done by my sister at EPI Kustom tattooing... A full back piece, it started just as my personal inspirations in japanese kanji complimented by a design which signifies growth, we then added a japanese geisha... but we still have a few hours to finish it all off! I also have a full sleeve which shows tribute to all the inspirational women in my life. Each object signifies a person, as well as a portrait of Sabina Kelley who is definitely an inspiration to me." How you keep your hair SO red? "It’s certainly A LOT of maintenance & it stains EVERYTHING but i love it so much that i put up with it. I think it’s really helped me build my Miss Mercy persona and given me an unique & recognizable look which i think is essential in modeling." Miss Mercy, What fascinates you about pinups? What i love about pin ups, is that all shapes and sizes are not only appreciated but desired & that girls who don’t fit within the mainstream have a culture to belong to. One of the best things i love about pin-up models are.... they are so friendly! There isn’t the drama and bitchiness that come along with the modelling world." Who is your fav pin up model? "Sabina Kelley is definitely one of my favorite models....It was amazing to work with her at the Sydney Tattoo Expo, something that would never have been possible without modeling! I also love Dayna Delux! Both inspire me so much, they have families and are international successes in their own right. Strong, amazing and beautiful!" Tell us Miss Mercy, Who is the inspiration behind your look? "I couldn’t really pin point one specific person that i took my style from because i wanted a look which was me and no one else. In saying that, i think subconsciously we take inspiration for fashion, hair & make-up from our idols or people we look up to. For me that’s Sabina Kelley and Dayna Delux. So i guess you can get a glimpse of both of their styles within mine!" "On a fashion front: When trying victory rolls, try wrapping your hair around small hair spray cans... Remember to spray and pin while the cans are still in your hair!On a more meaningful front: Be humble for the opportunities you get... Don’t expect amazing things if your not willing to work for them!"